As you know I love Angels and ran across this article. I thought I would share it with you. As You Know I Love Angels! Care2 puts out so many great articles. I thought I would share this one with you. I’m always looking for natural ways that enhance your health. Enjoy! Although many people often associate chia seeds with the infamous ch-ch-ch-chia pet, their purpose goes beyond a ceramic puppy planter. Chia seeds are powerful little bundles that can offer serious health benefits. Here are 6 reasons to consider adding more chia into your diet. Nutrient rich. For such a tiny seed, chia packs a mighty punch. They are very high in fiber, high in protein, high in healthy and hard-to-find omega-3 fatty acids, and are even a good source of calcium and phosphorus. That’s in a single, tablespoon serving. All of these nutrients are packed into a lean little powerhouse, making chia an excellent go-to snack when you need energy. Antioxidants. Due to an incredibly high quantity of phenols, chia seeds have incredible anti-inflammatory properties. A study in Mexico showed that they have the potential to thwart a huge amount of free radical damage. If you’re looking to prevent inflammatory damage like premature skin aging, try adding in some chia. Improve digestion. With a high amount of fiber, chia promotes regularity and a healthy stool. Its gel-like consistency when soaked can also support the growth of beneficial probiotics in the gut. Your gut bacteria are essential to your health and can even influence your weight and immune system, so it’s important to support them in any way you can. Fights cancer. Alpha linoleic acid (ALA), an omega-3 fatty acid found in chia, has actually been shown in studies to limit the growth of cancer cells in both breast and cervical cancers. While the research needs to be continued, getting more omega-3s in your diet is generally a beneficial idea, as it also largely aids heart health. Prevent diabetes. 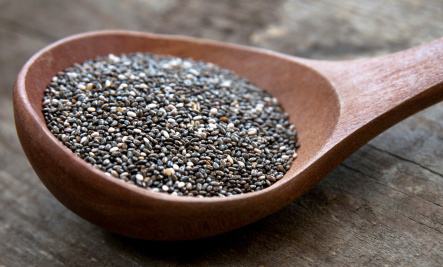 Chia seeds are loaded with fiber and healthy fats, which combine to balance blood sugar levels. However, there have been some fascinating studies demonstrating chia’s ability to prevent metabolic disorders like insulin resistance, perhaps due to its high ALA content. Chia was shown to prevent the onset of insulin resistance in mice fed a sugar-rich diet, and was shown to reverse insulin resistance in mice that had already developed the condition. What a great reason to enjoy some chia! Improve energy and metabolism. Chia seeds aren’t laden with sugar, but have actually been shown to have the same energizing benefits as a sugar-heavy sports drink. A study published in the Journal of Strength & Conditioning showed that chia was as effective as sports drinks for endurance activities lasting over 90 minutes. Although chia may not have a huge impact on shorter workouts, it’s still a smart choice to fuel up pre-workout while improving metabolism and weight maintenance. Chia seeds boast numerous health benefits. So, what’s a great way to consume chia seeds? Chia pudding, of course! Let 2 tablespoons of chia soak in 2 cups of milk (half coconut, half cashew is a good call) overnight. Chop in freshly diced mango or berries, maple syrup, pecans, and/or some vanilla extract, and enjoy! A delicious, healthy breakfast pudding sure to brighten up any morning.